By the way, referring to my previous post…the potatoes in any kind of carne asada are not so great the next day as leftovers, so try to eat all the tatties on the first sitting. The sauce and the meat however remain delicious. If you cook some pasta, (preferably spaghetti or linguini) al dente, drain it and then add it to the original pan of meat and yummy sauce, give it a good mix, you will get a whole new dish and it’s absolutely fantastic!!! I really recommend doing this. Time for another of my Mum’s classic and timeless recipes, honed to perfection over nearly 60 years as a professional chef. Marinade your chosen meat in some good olive oil, black pepper, plenty of garlic, fresh chopped parsley some decent white wine or dry sherry and even a splash of brandy if you are feeling fancy. No salt tho, that will be added later during the cooking process. Remove meat from the marinade and brown it in a large frying pan. You should take your time with this process and really get the meat good and brown all over as this caramelisation is where a lot of the flavour will come from. Meanwhile in another large pan, start to gently fry some roughly chopped onions and red pepper and garlic. When your meat is good and brown you can add it to the onions and pepper pan. Deglaze the frying pan with some good meat stock and add this to the chicken along with some saffron, dry sherry, a splash of brandy and more stock till the meat is just covered with liquid, simmer for a few minutes and then add salt to taste. You can then put the pan with a lid into the oven (or keep it on the hob) and allow to simmer gently till the meat is tender, depending on the cut and type this could take anything from 45 minutes to a couple of hours. Add a little more stock if you need to during this process. When the meat is cooked remove it from the sauce and keep it warm in a dish. Meanwhile. Add some peeled potatoes and carrots (both cut into big chunks) and add them to the delicious meaty sauce. Simmer gently till they are cooked. The potatoes will take on a lovely golden colour from the saffron and will be super tasty. 10 minutes or so before the veg is cooked you can add some thick slices of red pepper for garnish and colour. Once your veg is cooked put the meat back into the pan and make sure it is thoroughly warm. Serve with big hunks of bread to soak up all those lovely juices. This is an absolute Spanish staple and is really worth the trouble. As ever thanks to Carmen, my mum, a genius in the kitchen and semi legendary round these parts for her cooking prowess! We need to talk about food so it’s time for another recipe from my mum…for those who don’t know she was a professional chef for 50 plus years, now in retirement she still lives to cook and i for one am not complaining! 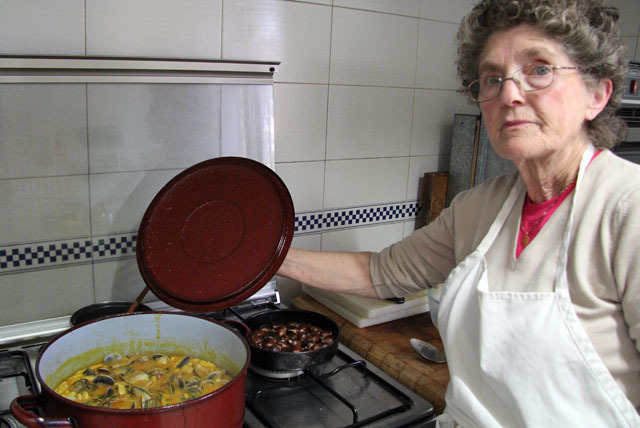 Here is how she makes Fabada con Almejas or Beans with Clams, it’s rich deep and unctuous in flavour and always has to be eaten with really good crusty bread. Add plain cold water, enough to just cover the contents in the pan, add some saffron and put to boil, (adjust seasoning to taste) and cook until the beans are almost tender**. 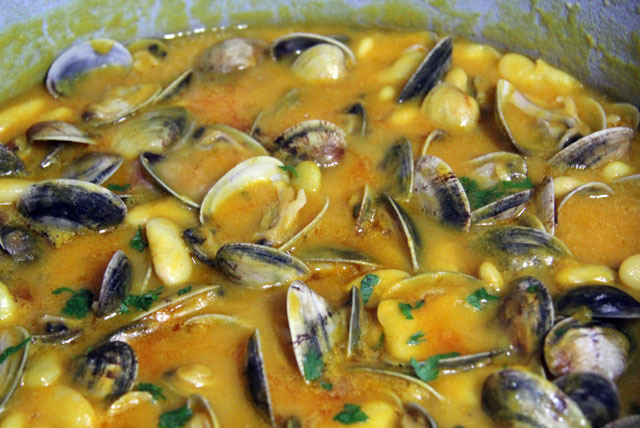 When the big chunks of vegetables and garlic are soft, fish them out and liquidise them in a blender with a little of the bean liquid and/or cooked clams liquor (see below). Put the thick veg puree back in the pan with the beans to thicken the sauce. Meanwhile fry some sliced garlic in a frying pan with lots of olive oil, when the garlic begins to be golden, take off the heat and allow to cool a little, add a teaspoon of Spanish sweet paprika, stir it in and deposit the oily mixture into the pan with the beans. Add a little chilli at this point (flakes or powder). 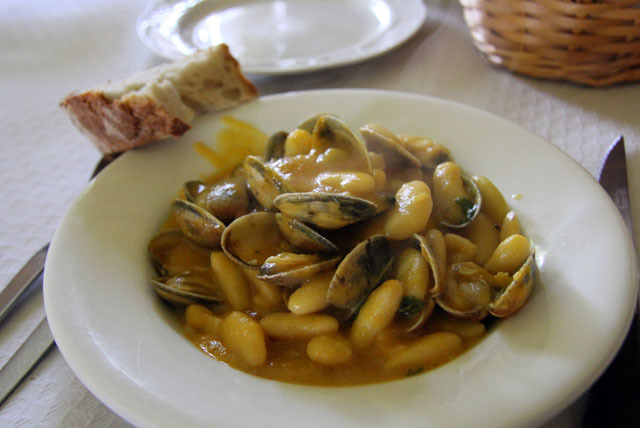 *about those beans…well it’s easy if you are in Spain, you just use Asturian fabas/beans i think you can find them in the UK if you look hard! Don’t use Judion beans, ‘cos the skins can be a bit tough. Basically you need a big fat white dried bean that has been soaked overnight… but don’t use butter beans…they are not robust enough and they will beak up in the cooking process. The quest is yours! ** how long to cook the beans? in the photos above mum used her own beans fresh from the garden so it took less than half an hour till they were tender, but if you are using pre soaked dried beans it can be anything from 45 mins to over an hour, you just have to keep checking them. i decide to do the same with the wild garlic leaves…works really well but be warned this is a far more pungent (but delicious) version…after processing more than half a kilo of wild garlic, my home smells really REALLY of garlic for a day or two! The pesto freezes really well, i use an ice cube to portion it out. I have so many leaves that i try some other methods of preservation. I make a wild garlic paste by whizzing it up with some olive oil – the ordinary kind, nothing fancy- and salt (for every 100g of leaves use 100g of oil and 6g salt) . I read that this will keep in a sterilised jar in the fridge for many months…just make sure you top it up with a layer of oil to stop the leaves oxidising. I use it to boost the flavour of soups or stews or in marinades. …and do not disguard the stalks, they are delicious, i wilt them along with some of the leaves, v nice with steak or fish, or add them to a daal.